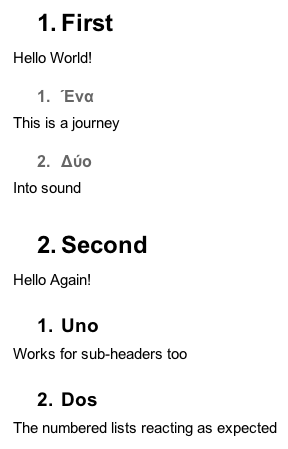 Is there a way to automatically number headings in Google Docs? It used to be possible with CSS but this feature isn't supported anymore in the new Google Docs version. Actually it is possible even without editing the HTML/CSS. I'll give you an example with a blank document but once you'll figure out how it works you will be able to do it on already existed document. Also if you are not already using the keyboard shortcuts I would suggest you to start using them (in this example I'm using Mac's shortcuts, but you can easily find the correct ones for your own OS). I hope that it will be useful to something. Disclaimer: This might be working only on Chrome, but hey, at least it works. How to use: There is a widget on the right hand side and at the top of it you can select your numbering scheme and refresh the headings with the usual refresh button. So just set the numbering scheme and update the heading after you are done with editing and you will have correct and updated section/subsection/... numbers. Now there is an add-on called Heading Numbers that you can use to add any custom numbering style. It allows you to choose/define, update and remove automatic heading numbers. I released this add-on a couple of weeks ago. Check it out on my homepage or in the add-on store. Select the option to create the script for Google Docs. Replace the Content of Code.gs with the code below. Save it and name the project as say addHeaderNumbering. Click play icon for the function addHeaderNumbering (authorize it when asked). There is no online help for use of the Table of Contents app (either never was or it got taken down) The help button points to a page that tries to up-sell you with a trial http://lumapps-www.appspot.com/en/ instead of providing help. Heading Numbers provides a FAQ at http://www.lorut.no/add-ons/heading-numbers-for-google-docs/faq/. 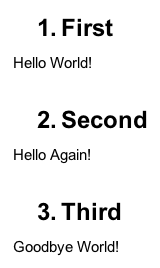 The Table of Contents and Heading Numbers apps don’t play well together in terms of renumbering the headings: I created numbered headings using Heading Numbers, and applied similar headings using Table of Contents, and it added two sets of numbers into the headings. The same is the case if you reverse the order by applying the headings using Table of Contents first, then Heading Numbers. Table of Contents doesn’t have the same number of heading styles as Heading Numbers does. But having the side-bar in Table of Contents is still handy. I select As Is from the Table of Contents side bar and am able to click the refresh button to see and navigate the table of contents. Heading Numbers has a Clear operation. Table of Contents does not. The Clear operation does not fix the interaction issue described above, which is quite painful because you have to manually fix them. Neither app updates a Table of Contents that is inserted into the document (via the Insert/Table of Contents menu). How to get Google Docs to auto-substitute an equation? Can you link directly to a new copy of a Google Docs or Sheets? How to manually add a point to document outline in Google Documents?